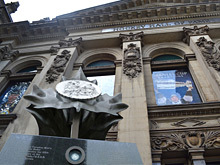 The Team Canada '72 monument located on the south wall of the Hockey Hall of Fame's Esso Great Hall. Click to enlarge. 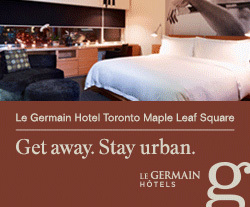 It is one of the most photographed areas of Toronto. At the busy corner of Yonge and Front Streets in downtown Toronto sits a little patch of green; a tiny oasis in a hustling world of commerce. There, displayed on the northwest corner directly beside the Hockey Hall of Fame, sits two items of great hockey importance. One is a visual tribute to Team Canada '72. The other is a seventeen-foot bronze statue. 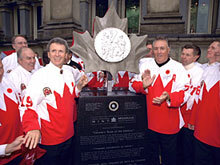 Team Canada '72 teammates surround the monument during its official unveiling. 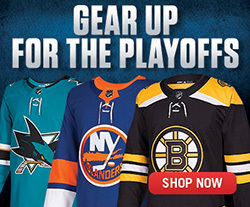 From left to right: Ken Dryden, Ron Ellis, Paul Henderson, Phil Esposito and Stan Mikita. Click to enlarge. During September 1972, in a historic tournament of incredible national magnitude, Team Canada faced the Soviets in an eight-game series. It was a defining moment in Canadian sport, as Paul Henderson's goal late in the final contest on September 28, 1972 gave Canada a victory that resonated from Victoria to St. John's. Team Canada was named 'Team of the Century' in a 1999 poll conducted by Canadian Press. To commemorate this outstanding achievement, the Royal Canadian Mint sponsored the Team Canada '72 Millennium Tribute monument which was officially unveiled on November 10, 2000. All but two of the team's players were present for the ceremony. The 17-foot bronze 'Our Game' statue. Click to enlarge. Five or six steps away from the Team Canada 72 tribute is a scene depicting excited young hockey players climbing over the boards ready for action. Commissioned by the Hockey Hall of Fame in 1993, the artist, Edie Parker from Oakville Ontario, created a work titled 'Our Game' that was inspired by an early 1970's magazine advertisement. If the CN Tower is the most photographed icon in Toronto, then this statue is surely a close second. The 'Our Game' maquette is as recognizable a landmark as the magnificent old bank building that houses the Hockey Hall of Fame's Great Hall. 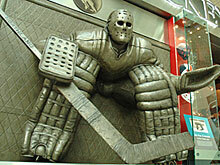 The larger-than-life statue honouring Ken Danby's "At The Crease" painting outside the Spirit of Hockey Store. 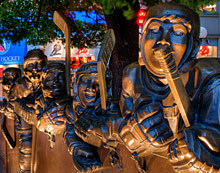 The newest sculpture in the Hockey Hall of Fame's collection will have a familiar look to hockey fans of all ages. Guarding the Spirit of Hockey store entrance below the atrium in Sam Pollock Square is a larger-than-life statue honouring Ken Danby's iconic "At The Crease" painting. Sure to be a popular photo-op, the sculpture is also a fitting tribute to Ken Danby, the renowned Canadian artist who passed away in 2007.